Additional Info: Set on a lovely large elevated plot with a large enclosed decked area and garden with bird feeders. When enquiring about our caravan please tell us the dates you require, and how many adults and children will be staying. Please note we now only accept bookings for 4 people. 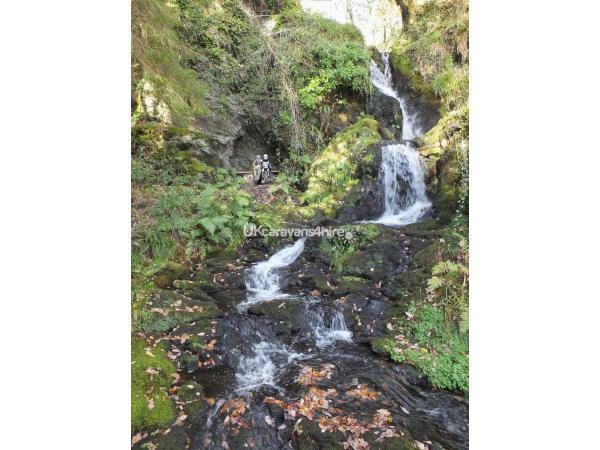 Aberdunant Hall Holiday Park in North Wales is nestled in a beautiful countryside setting, surrounded by over 200 acres of ancient woodlands with babbling streams, waterfalls and wonderful woodland walks, it's easy to see why this lovely peaceful site is one of the leading holiday destinations in Wales. 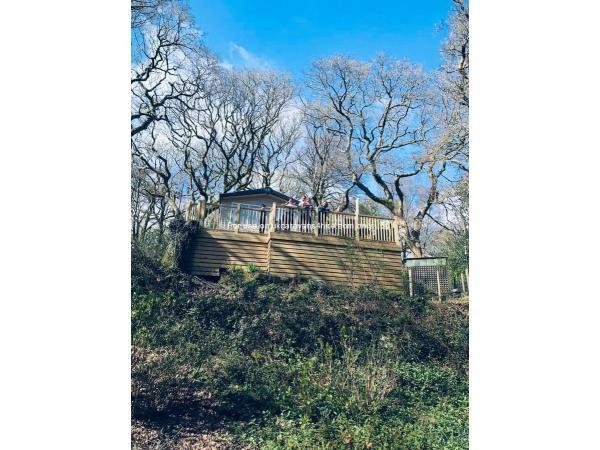 The site lies within the Snowdonia National Park and is perfect for couples looking for a peaceful relaxing break away or families looking for adventure and those wanting to explore the amazing mountains/hills and the great variety of walks. But it's not just stunning scenery, climbing mountains and wonderful walks this place has to offer, there are also some lovely coves and beaches and gorgeous villages with unique shops and cafes. We stayed at the site in July 2018 and from the moment we arrived we instantly fell in love with the site and the beautiful area, we felt very relaxed and we really enjoyed our stay so much that by the end of that week we had decided we would like to buy our own holiday home there, we just didn't want to leave! We only hire out for a short time due to wanting to spend time at our Happy Place ourselves, please check our availability calendar. It's mainly school Holidays but we may on the odd occasion accept a Mon to Fri Booking so please ask for info. We do not offer weekend hire I'm afraid. Squirrels Retreat is our lovely modern 2015 Swift Biarritz caravan. There is gas central heating and it's double glazed with a semi separate spacious lounge with comfortable L-shaped fitted seating, a LCD SMART TV, a blu-ray DVD player a Playstation and an Amazon smart speaker with Alexa. We also leave a good selection of dvds, board games and books for you to use. Leading off from the lounge area is a very impressive well equipped Kitchen with full size cooker, integrated fridge and separate freezer, Dolce Gusto coffee machine, slow cooker, sandwich maker, electric egg poacher, a kettle, toaster and a microwave. The main family bathroom has a shower, hand basin and a mirror with light and electric shaver point then there is a separate toilet and hand basin. The master bedroom has a double bed and to add extra comfort it also has a memory foam mattress topper, there are overhead cupboards, wardrobes and draws with a vanity area with mirror and stool, we also supply an hairdryer. Bedroom 2 : Twin beds, wardrobe, over head cupboards and a T.V dvd combi. There is a further twin bedroom with wardrobe and cupboards. All beds have pillow and mattress protectors. We supply tea towels/hand towels and the beds are made up ready for your arrival, so all you have to do is unpack and enjoy your stay. The patio doors from the lounge area lead out onto a large enclosed decked area where you will find a variety of seating options, we have a couple of rattan patio table's & chairs, and a storage bench. 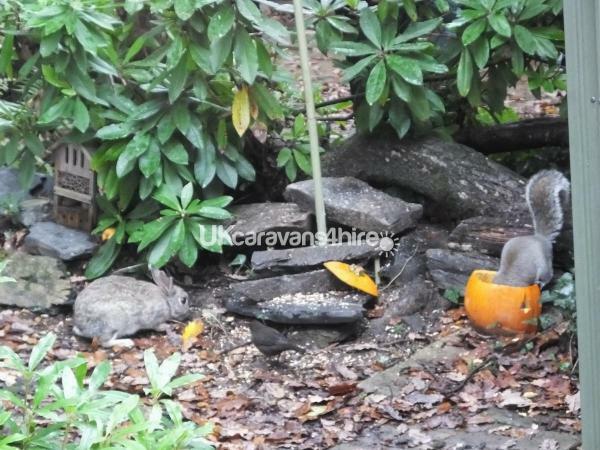 This area is perfect for sitting out watching the great variety of birds that visit our bird table's ..... but watch out for those cheeky squirrels! There is also a small storage shed with relaxer chairs and children's buckets and spades etc. 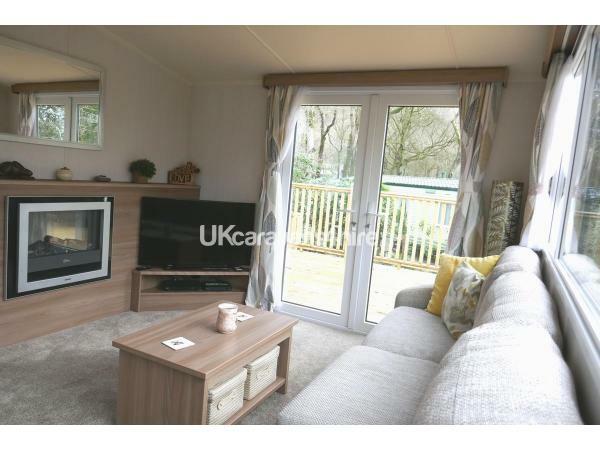 The caravan is sited on a large enclosed plot with your own designated parking bay next to the caravan. We don't use a cleaning company but clean and prepare our own caravan, we like to make sure everything is how it should be when our guests arrive to start their holiday. We have also put together a large folder full of information about the area, ideas for days out and a variety of walks which we hope you will find useful during your stay. Although the caravan is 3 bedroomed we have now decided to only accept bookings for a maximum of 4 people. PLEASE NOTE: Our caravan is advertised has NO PETS allowed but please be advised we do allow our own dogs to stay at the caravan, and although it's thoroughly cleaned between stays it may not be suitable for allergy suffers. No reviews found. If you have recently stayed in this holiday home please leave a review, it only takes a few moments and will really help future guests when they are searching for holiday accommodation at Aberdunant Hall.